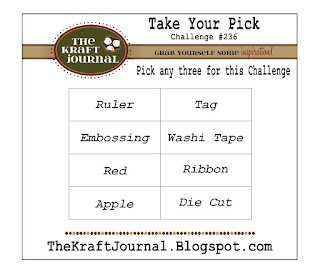 I love making school themed cards and this week's Take Your Pick challenge is perfect for that. I started with a card base of Brown Kraft Cover Weight Cardstock which I layered with an alphabet patterned paper leaving the bottom of the kraft exposed. I stamped a Reverse Confetti sentiment in the lower right corner in black ink. I took a length of Natural Twill Tape and wrapped it around the card front where the patterned paper ended tying the ends off with a bow of Dark Green Baker's Twine and a red button. Using Buff Ivory Cardstock, I created an Alpha embossed background for the focal image punching the bottom to create a notebook look. I then wrapped more Dark Green Baker's Twine around the card a few time and tied off in a bow. Next adding the apple that was cut using my Cricut and the Preserves Cartridge by using various patterned papers, Buff Ivory Cardstock and Blackboard Stock Paper. For a final finishing touch, I added a small double bow at the top of the apple created with Dark Green Baker's Twine. Here is the Take Your Pick Inspiration for this week. I love it! That little apple with the gingham print is so, so adorable! Your gingham apple is perfectly adorable and I like the alphabet background. This is delightful Tammy!! I LOVE the apple and your school theme! Darling card, Tammy! I love this, Tammy--wonderful details! awesome. such a cute apple! The Kraft Journal - CAS - Thank you!